The 2nd annual Points of Light Lantern Celebration last night was a great success. A year ago, this event burst on the Lowell scene quite unexpectedly. Back then, despite very cold temperatures, hundreds of people gathered along the Western Canal in the heart of the Acre to decorate paper lanterns and launch them into the canal in the midst of music, dancing and ethnic food. This year, the weather was much nicer and the crowd was just as large. 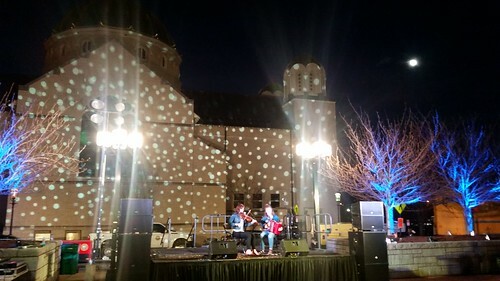 The main stage was on Ecumenical Plaza, the public space that spans the Western Canal between St. Patrick’s Church and Holy Trinity Greek Orthodox Church. Ecumenical Plaza was created in the 1970s by the Model Cities Program to provide a space to bring all of Lowell’s people and cultures together. In the 45 year history of the space, I don’t recall any event living up to the hopes to its creators as well as the Points of Light Lantern Celebration has done. Last night began with welcoming remarks from Mayor Bill Samaras, followed by a performance by the Middlesex Community College cast of “Spring Awakening,” a Tony-award winning Broadway musical that will be performed next weekend at Lowell High’s Burgoyne Theater. They were followed by “No Bully Zone,” a group of young people who use dance to raise awareness of bullying. Next was a duet from the Boys and Girls Club of Greater Lowell who performed an original song that they composed. An Angkor Dance Troupe performance then brought us to a speaking program featuring City Councilors Vesna Nuon, Karen Cirillo, Ed Kennedy and Rodney Elliott, and State Representative Rady Mom. Also speaking was Theresa Farrah of Clark Insurance, a major sponsor of this event. A poem by Augustus Clayton closed that portion of the program. Because of a shift in the wind direction, the launch point for the lanterns had to be switched from Ecumenical Plaza to the Broadway bridge over the canal. Audience members pitched in to move the 1000 lanterns down the block. As they were placed into the canal and carried back towards the plaza by the wind, Natalya Kay, two Irish folk musicians, entertained the crowd. They were followed by Samana & Talanto, two Venezuelan folk musicians. 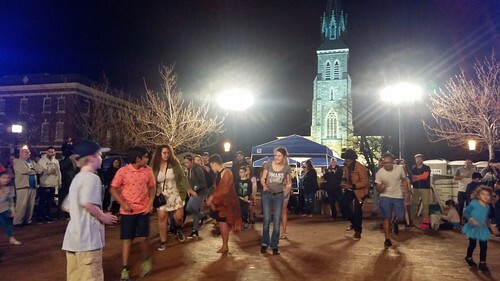 In addition to the performances, several church groups had food booths, giving those present a choice of Hispanic, Burmese, African and Greek cuisine, along with candy and baked goods from Sweetest Memories. Having participated in both of these events, I would say that while both were terrific, the second one benefited from the experience of the first. Next year’s Third Annual Points of Light Lantern Celebration should be even better. 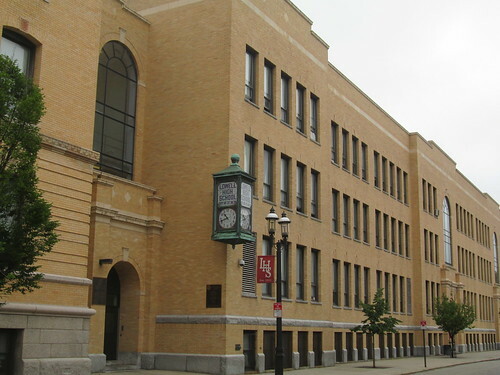 The Lowell School Building Committee will meet in a public session tomorrow night (Monday, April 30, 2018) at 6:30 pm in the City Council Chambers. According to the agenda, the committee will receive an update on developments since the committee’s last meeting followed by a review of the Design Options, then a report on the latest cost estimates. That will be followed by a community forum. After that, the School Building Committee will vote on which option it will recommend to the City Council as a preferred option. At the next evening’s City Council meeting (Tuesday, May 1, 2018), the full council will takes its vote on a preferred site for the High School. Be sure to check back here Monday morning for Mimi Parseghian’s City Council preview post. Last Tuesday, the council voted to have the Law Department draft an ordinance that would ban the use of plastic bags by larger retailers in Lowell. The vote was 6 to 2 with Councilors Cirillo, Kennedy, Leahy, Milinazzo, Nuon and Mayor Samaras in favor. Councilors Elliott and Conway were opposed. (Councilor Mercier was absent). A number of city residents spoke in favor of the motion. While almost everyone agrees with the need to reduce the use of plastic bags, the two councilors who opposed this motion prefer to wait for the legislature to enact a statewide ban. Imposing a ban on a community-by-community basis, they argued, penalizes retailers in the communities in which the ban is imposed since their customers will simply go to an adjoining town that has no such ban. Proponents of the local ban say that every individual community that adopts a plastic ban increases the momentum for a statewide ban and puts pressure on the legislature to act. They also say that the local ban will apply only to large retailers and will not affect small businesses. Some readers are probably old enough to remember the pre-plastic bag era. My memory is that brown paper bags were used regularly in stores of all types. Even today when checking out at the grocery store, I am asked “paper or plastic” with no indication that the retailer prefers one over the other. (And that only happens when I fail to bring my reusable canvas bags with me). I’m not sure how quickly the proposed ordinance will come back to the council, but when it does, the public hearing should be well-attended with advocates on both sides of this issue. The council discussion last Tuesday about marijuana was enlightening – maybe “interesting” is a better word. As marijuana becomes legal, many practical problems will arise. Is it permissible to smoke it in public? If you can’t consume alcohol in a public place, why should you be able to smoke marijuana there? What about in places where smoking is already banned like hotels, restaurants and even some apartment buildings? If you’re not allowed to smoke a cigarette in your apartment, neither should you be permitted to smoke a joint. These issues arise in an unusual way because for decades, marijuana has been illegal but has been openly used. If it’s already illegal, no one had to regulate how or where it was used since using it already broke the law. Now that it is legal, all of these practical problems must be addressed. Enacted by the state legislature in 2000, the Community Preservation Act (CPA) provides a mechanism and funding for communities to preserve open space, provide affordable housing, preserve historic structures, and provide recreational space. The law requires the voters to pass a local override that would raise property taxes to fund the particular project with the state matching at least a portion of the cost. The money for the state matching fund comes from a surcharge on documents recorded at the registry of deeds. Since 2000, that surcharge has been $20 per document. For example, if you pay off your mortgage and go to the registry to record its discharge, the total fee is $75 ($50 recording fee, $20 CPA surcharge, and a $5 technology surcharge). There is now a bill pending before the state legislature that would increase the surcharge from $20 per document to $50, so that same recording fee for a mortgage discharge would go from $75 to $105. The bill has several dozen sponsors so there is at least some chance that it will be enacted. One of the motivations for this bill is that so many communities have taken advantage of the Community Preservation Act that the matching fund is insufficient to meet the need. Since 2000, more than half the cities and towns in Massachusetts have voted to participate. In the Middlesex North Registry of Deeds District, eight of the ten communities have opted in. Carlisle, Chelmsford, Dracut, Tynsborough and Westford all adopted it in 2001; Dunstable and Tewksbury in 2006; and Billerica in 2016. Only Wilmington and Lowell have failed to take advantage of it. This is especially unfortunate for Lowell since the surcharge on documents recorded at the registry of deeds for properties in Lowell since 2000 has generated $5.8 million in CPA matching funds, all of which has gone to other communities. There are a couple of interesting projects before the Lowell Planning Board. The first is 484 Merrimack Street which is the next building up from Sizzling Kitchen. Also, from 1915 to 1971, 484 Merrimack was the Royal Theater, one of nearly a dozen movie houses in downtown Lowell. This new proposal would have a restaurant on the first floor and 15 market rate studio apartments in the top three floors. As with most projects in this part of the city, the challenge is the availability of parking. This project proposed spaces at the Ayotte Garage which at first thought seems far away but really isn’t (this building is just a few doors past the Pollard Library and across the street). The matter was before the Planning Board at its April 19, 2018 meeting. I haven’t had a chance to watch the replay to find out what happened. The second new planning board project that caught my eye is for 851 Middlesex Street which is just beyond Clemente Field. This proposal seeks to place a fresh seafood market called Mill City Seafood in the first floor of this 2.5 story woodframe building that has apartments on the upper floors. 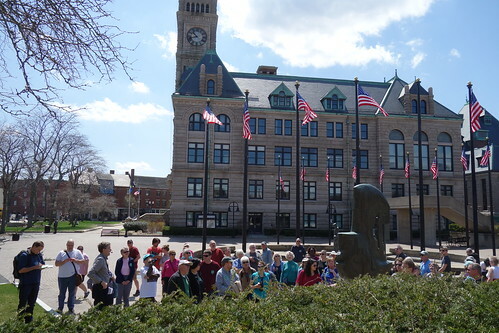 Lowell Walks resumed yesterday afternoon with a City Hall Monuments walk that drew 70 people. The same walk will be given today at 1pm beginning at Lowell National Park Visitor Center. The tour is free and proceeds rain or shine. This was a wonderful event, location, and use of our canals I am proud of Lowell’s ways of re inventing space with multi cultural family activities. I would like to ask the powers be to consider expanding this event to a later time of year when being outside is a bit warmer and many more could attend. 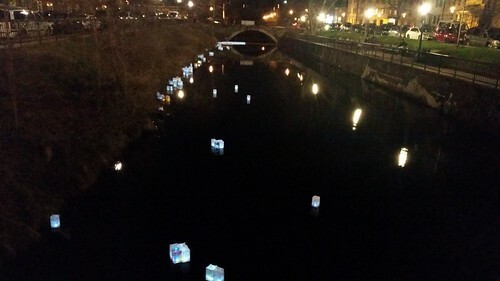 Also I would ask and offer to help explore the use of cauldrons in the canal for fire (Please look up Providence’s Water Fire Festivals) Lowell could host such a cool event as well especially since we already have half the festival with the canals and lanterns.